I am a Consultant Psychiatrist and specialist gender clinician, working full-time in the NHS as well as heading up GenderCare. My preferred pronouns are he/him/his. I graduated from University of Aberdeen Medical School in 1993, with a Distinction in Psychiatry. After completing my general medical and surgical house jobs, I moved to Edinburgh for postgraduate training in Psychiatry, gaining both parts of my Membership of the Royal College of Psychiatrists (MRCPsych) degree in 1998, including training in psychotherapy. 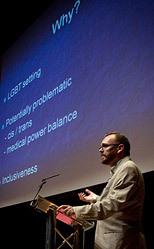 I also developed research interests in stigma and LGBT issues. In 2001, I moved to London to advance my training to Consultant level. In 2005, I obtained my Certificate of Completion of Specialist Training (CCST) in both General Adult and Liaison Psychiatry. Having always enjoyed working alongside medical and surgical colleagues, I became curious about processes of gender transition as managed within the NHS. I approached Charing Cross Gender Identity Clinic (CX GIC) and began working there in 2002. Initially locum, I was made a permanent Consultant in 2007. I am particularly interested in engagement with the wider binary and non-binary trans community, and have represented CX GIC in a number of arenas, including the Department of Health Sexual Orientation & Gender Identity Advisory Group (SOGIAG), the Parliamentary Forum on Gender Variance and various NHS England workshops and consultation events. I have presented at events hosted by the World Professional Association for Transgender Health (WPATH), the European Professional Association for Transgender Health (EPATH), Greater London Authority, the Gay & Lesbian Association of Doctors & Dentists, Equality Ireland, the LGBT Health Summit, TG10, Trans London, FTM London, The Gender Trust and MORF at the LGBT Foundation, Manchester. I am a member of WPATH, EPATH and the British Association of Gender Identity Specialists (BAGIS). I am listed by the Gender Recognition Panel as a specialist approved to provide GRC reports and by the Royal College of Psychiatrists as a member with special interest and experience in gender dysphoria. I have contributed a chapter on the history of CX GIC to Christine Burns' essay anthology, Trans Britain: Our Long Journey from the Shadows and I wrote the foreword to Ben Vincent's Transgender Health: A Practitioner's Guide to Binary and Non-Binary Trans Patient Care. I am an occasional columnist for the Huffington Post. I have taken part in a number of radio and television documentaries on the subject of gender dysphoria, and advised EastEnders on related matters. In 2009, I was interviewed by equality and diversity specialist and campaigner Christine Burns, for her Just Plain Sense podcast series. Listen to the podcast. In 2015, I was privileged to be included in The Independent on Sunday's Rainbow List of the most influential LGBTI people in the UK. 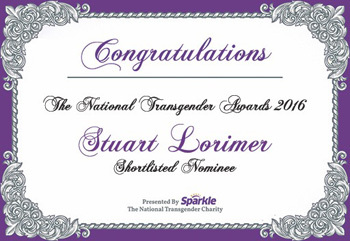 I was nominated, in the Trans Ally category, for the 2016 Sparkle National Transgender Awards.